It's that time of year again, where everyone is shopping, eating & decorating. We are sure the inside of your home is stuffed with greens, candles and twinkle lights. All done in the holiday spirit. However, this time of year also finds your home being visited by many invited guests. So, look at this as a friendly reminder to create a warm and welcoming entry. How do you do that? Start with the garden planters you already have. Maybe you have two identical planters standing guard beside your main entry. By now you know that you should have them filled with evergreens boughs, evergreen bushes or innate objects like bamboo or reeds. Don't leave them sitting empty. They look lonely and uninviting! 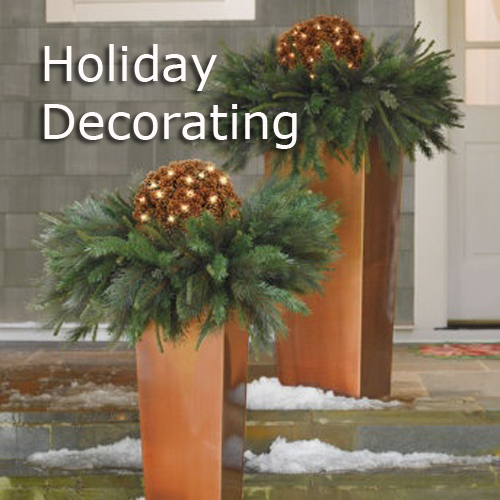 Surround the top soil with pine cones, oranges, red holiday glass balls, or decorative rock. This little touch really adds a lot. What we like about the photo above is the use of evergreen wreaths and pine cones balls. How simple is that and decorative to boot! Metal garden planters tend to be simple in design with clean line and not a lot of decoration. This look is simple and lovely at the same time. As always we ask you to draw on your imagination and create the kind of entry that you are proud of. Believe us, your guest will comment! Read more..... Around your garden in December. Read more..... Around your yard in December.